birds : As there was a change in the weather from sun to rain showers, I was disappointed to find practically zero migrants on Pleinmont on Thursday. A Greenshank flew off the island to the South and it was quickly persued by a Peregrine, but it escaped to carry on its autumn migration. Checking the gulls at Cobo on the way home there were 6 Med Gulls in the BHG flock - 2 ads, 4 1st-years - the most I'd ever seen in Guernsey. nonsense : Well 37 years old today - its a good job I don't feel that old, although playing two matches of football in 24 hours was probably a mistake (sorry legs). My prediction that Aidan would soon work out a new way up onto the walls came true this week. 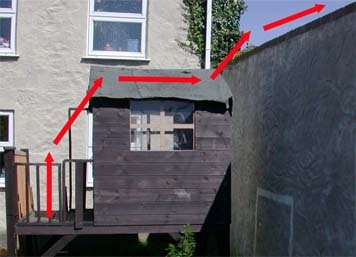 As you can see on the diagram below, this involved climbing the handrail of the treehouse balcony, hitching himself up onto the roof and jumping across the ravine between the treehouse and the wall. I think I might enter him in the World Freerunning Championships.